Many of the artworks in Herstory at Touchstones Rochdale are made from everyday objects, or draw on familiar and banal imagery. Whilst encouraging us to recognise and relate to the show, this also unsettles, raising questions about gender and identity and how popular portrayals of women and girls influence our understandings of femininity. Mono Hatoum’s delicate ‘Hair Necklace’ (1995) is made from that most intimate of materials, human hair, turning one of the most ephemeral aspects of our physicality into an object of value and collectability. Karen Kilimnik’s ‘Fountain of Youth (Cleanliness is Next to Godliness)’ (1992) arranges cosmetics products into an installation resembling a fountain – or an altar offering – suggesting that any quest for eternal youth is ultimately elusive, whether it’s sought through chemical or spiritual means. Gillian Wearing’s video collage ‘I’d Like to Teach the World to Sing’ (1995) features a series of women performing the titular tune on drinks bottles, joyfully subverting a well-known advertisement for a soft drinks manufacturer. ‘R.S.V.P 1977’ (reconstructed 2004), by Senga Nengudi, is a sculptural assemblage created from tightly stretched pairs of tights. If, as Negundi tells us, a woman’s life is in her purse, then tights are the archetypal standby for all occasions – here their practical and decorative functions combine in a portable art show. Herstory places these works of art, many of which are borrowed from the collection of prolific Italian collector Patrizia Sandretto Re Rebaudengo, alongside objects from the Touchstones’ social history collection. Together, they suggest that identity is made and remade over time by a composite of actions and forces, both overt and invisible. These include where we live and the unconscious influences wrought by the places around us, as well as what we buy and how it’s sold to us. They include the ways in which our expectations of people are shaped by how we talk about them. They also include the way we’re educated and the careers women are directed towards. They even include the types of subject matter and media considered to be appropriate for women artists. Several of the artists in Herstory have exhibited at Touchstones before. In the 1980s and 1990s, the gallery pursued a feminist, issues-based programme; in 1987, Barbara Kruger’s provocative juxtapositions of slogans and imagery were placed in the public eye, reproduced on billboards around Rochdale as an intervention into the town’s consciousness. 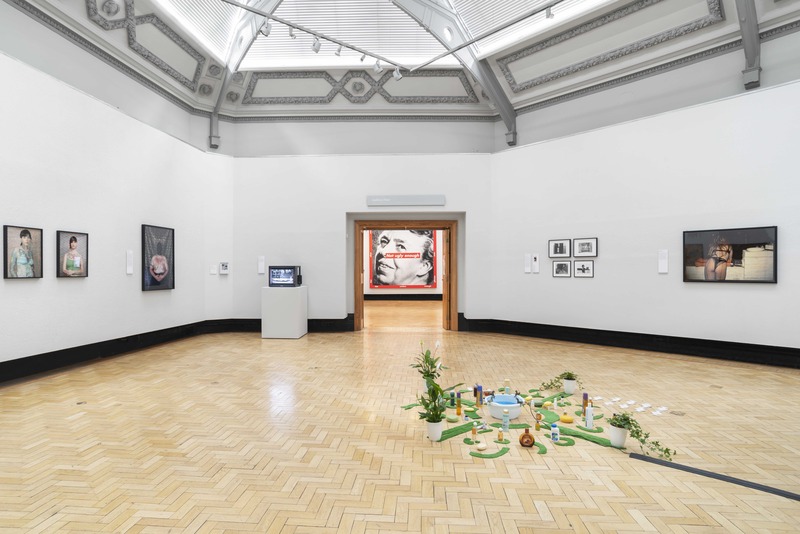 Today, Touchstones reignites the conversation with contemporary women and young people from Rochdale, who have responded to the themes in the show. In doing this, Herstory navigates between seemingly universal preoccupations, and collective experiences, and perspectives that are individual, localised and deeply personal. Herstory: Women Artists from the Collection of Patrizia Sandretto Re Rebaudengo runs until 29 September 2018 at Touchstones Rochdale.